Tub boats were small barges that could carry goods into difficult terrain. Obviously, they floated along tub boat canals – particularly in Shropshire, but where a hill was in the way, the boats were floated into rail borne cradles and hauled up. Blists Hill is in the Ironbridge Gorge area and is a large open air museum. 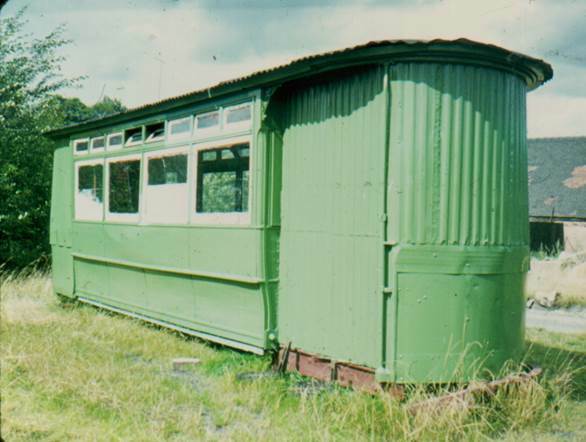 It has the Hay inclined plane – the tub boat railway that lifted the boats more than 200 feet from roughly River Severn level and it also has tub boats. I was there in 1972 when the museum was in its glorious infancy. There were traces of rail visible on the inclined plane. I think that’s me standing a bit up the slope so my wife must have had the old Canon Demi camera at that time. I believe that trackway is now fully restored and railed. No doubt it makes more sense in restored order but somehow it lacks that pioneering look. Up at the top the tub boat would have been re-floated in the canal for more of its journey, delivering coal to local factories. This was the scene back in 1972. The very rectangular vessel in front is an old wrought iron tub boat. Today I have a photo of a station, with hardly a railway in sight. The station looks not much more than an attractive brick hut. I owe my dad something here, for he captioned this slide (taken on my Canon Demi) and he even added a grid reference for posterity. My only mark on that is the R (upside down) at the bottom right. That’s a mark which tells me the photo was taken in the summer of 1973. My dad has added the information at the top. So this is a canal/rail interchange station. We can just see a bit of canal at bottom left and there is a railway bridge in the background. Now my dad has called it a passenger interchange and that would have happened for in days of yore canals did operate passenger services. But I suspect this was more a goods interchange point, between the Montgomery Canal and the railway linking Shrewsbury and Chester. I think this is a lovely building and it still exists. It’s where the arrow points on the map. Talk about a change of use. Once upon a time this had been a horse drawn tram car. When I saw it, and took this photo, which was back in 1973, it had reached the stage of being a museum exhibit. In between it had been a Gospel and Sunday School. That’s some change of use! Back in 1973 it was at Blists Hill Open Air Museum. That was a part of the Ironbridge Gorge cluster of museums in Shropshire. Back then Blists Hill was very much in its infancy and I believe it has changed out of all recognition since then and is now marketed as Blists Hill Victorian Town. A few photos on the web suggest this old relic might be there somewhere, now painted in a red colour and with added lettering to indicate its religious function. What I haven’t found is any real information. Where was it a tram? Was it mobile as a gospel vehicle? Where did it go? Where was it a Sunday School? When was it built? Has anyone got any answers? 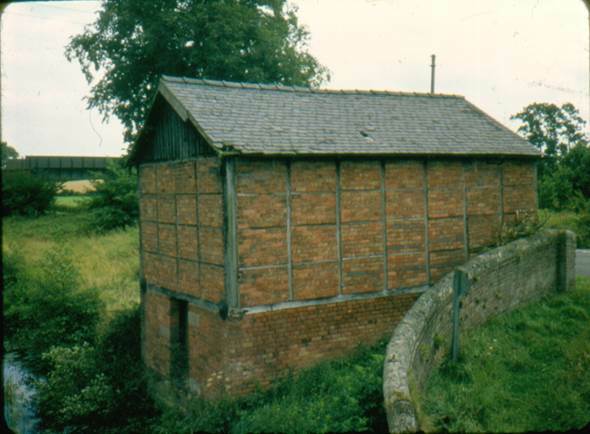 Back in 1973 my wife and I went on a course – ‘Industrial Archaeology of Shropshire’. The course organiser was my dad and for those, better off than we young married couples, there was accommodation provided at Attingham Hall. We, the impoverished ones, camped off site in our little tent. My dad organised but was also a student. The course tutor was a fantastic bloke called Barrie Trinder. On one occasion we went off to see a very early blast furnace and most interesting it was too, but some of us got waylaid by other distractions. 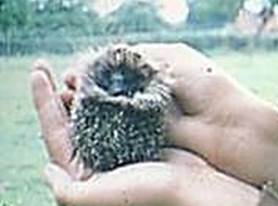 Not a good photo, but we found a baby hedgehog. I daresay it shouldn’t have been picked up! 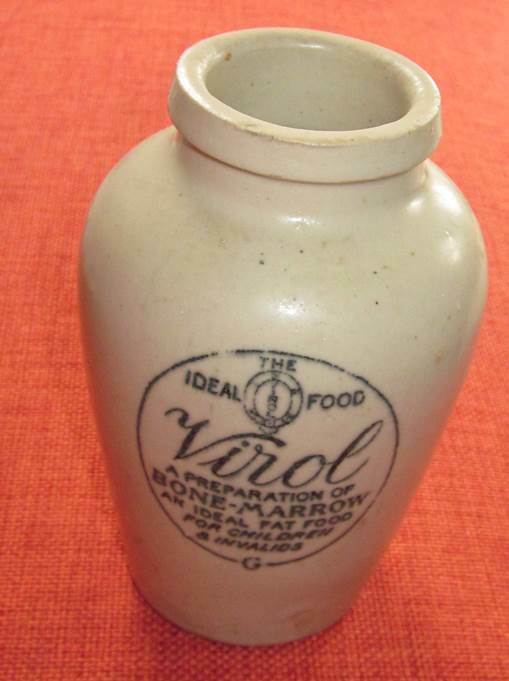 And there was also a rubbish tip on which we found a Virol jar. Now that, of course, we still have. I think it’s a lovely bit of earthenware and over the last more than 40 years, it has been much used as a vase for flowers. 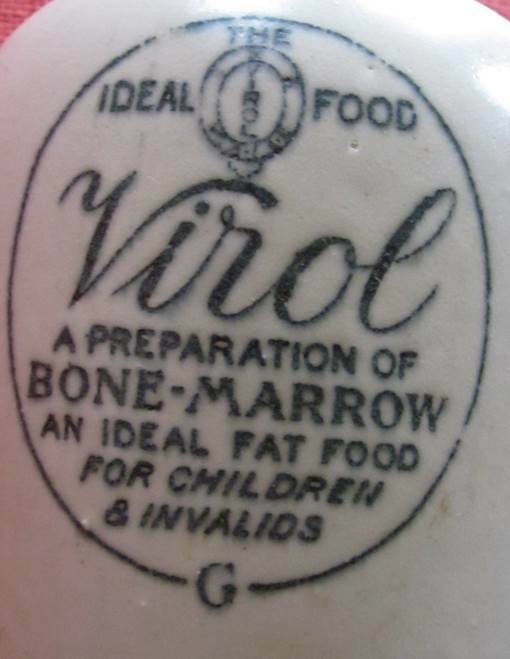 Virol described itself as ‘The Ideal Food’ and as ‘A preparation of bone-marrow. An ideal food for children and invalids’. The jars are common enough. I’m not a jot interested in cash value. I wouldn’t buy or sell at all. My collected items provide a jog to the memory. That’s their value to me. I just wish I could remember something more about the blast furnace we visited! 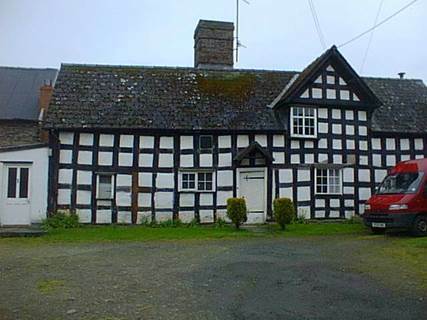 A book of poetry I have used before on this blog contains the following short verse about some places in Shropshire. Clunton, Clunbury, Clungunford and Clun Are the quietest places under the sun. It was the year 2000 when I visited some of these locations. Here’s Clunton. Gorgeous house. What a shame I got a red van in it. Certainly there wasn’t a lot going on there. 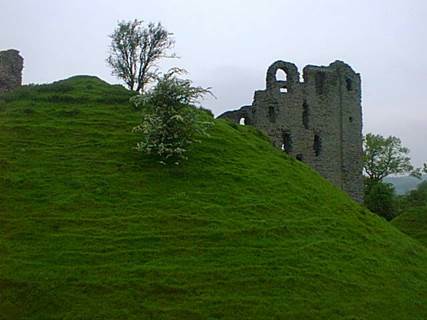 This is Clun Castle – seemingly deserted. And a lovely bridge over the River. 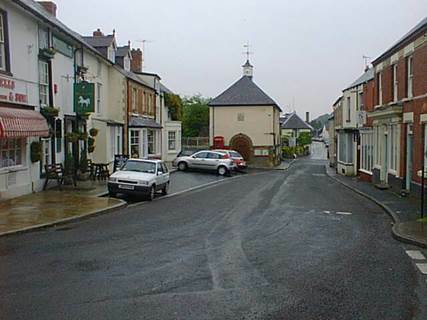 The village centre has cars, but no people. So those two places are certainly quiet, but definitely pretty. Good on them, I say. I’m going to guess that this is a photo everybody takes – hopefully, just a bit better than me by getting the top of the ironwork actually in the picture. This picture dates from 1972 and was taken on that little Canon Demi camera – the one that gave me 72 half frame sized slides on a roll of film. 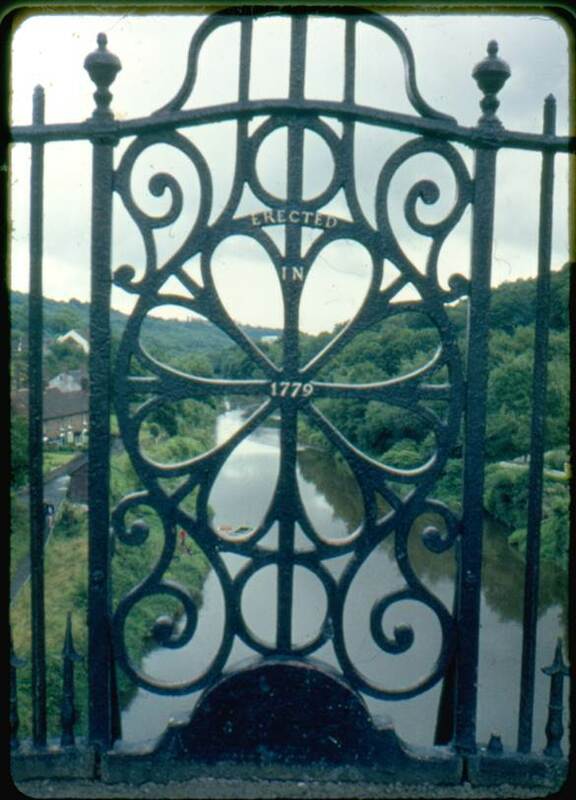 ‘The’ Ironbridge was the first ever bridge built of iron. The area of Coalbrookdale which grew up around this structure is called Ironbridge. The river down below is the River Severn and we are in Shropshire in England. We can see that the bridge was erected in 1779. It doesn’t tell us that the engineer was Abraham Darby. Neither does it tell us that the construction method used the techniques of carpentry. Where one piece of iron slotted into another, a wedge was used to hold it all firmly together. So a pioneering material was used but the construction was still done in age old ways. The result is an item of beauty. With remedial work it still stands today, 235 years on. But it only carries light traffic – pedestrians. One could say the bridge is the centrepiece of a varied set of museums stretching along the Ironbridge Gorge. It’s a perfect place for a nerd to visit. Bridges that carry water have a fascination all of their own. 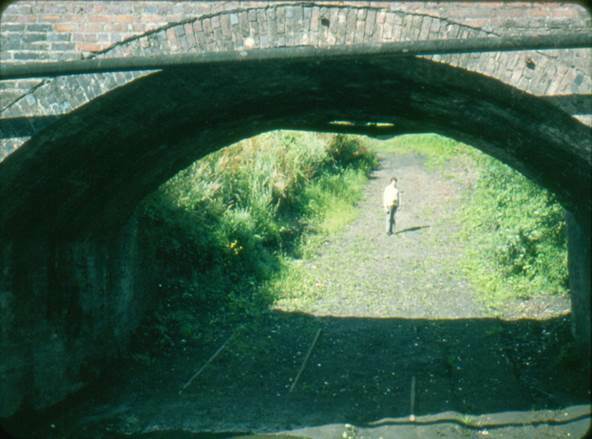 An unsung hero of this genre is the aqueduct at Longden upon Tern. It ought to be world famous! There we are. I even give a map so you can find it. 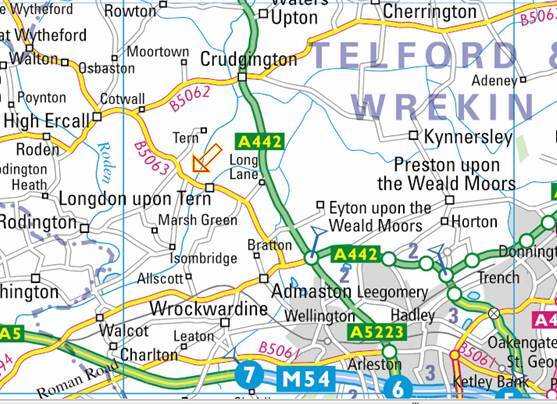 The big place at bottom left is Telford. Yes, we are in the cradle of the Industrial Revolution in Shropshire. Sadly, the aqueduct is no longer in use and most of the Shrewsbury Canal that it carried has reverted to nature. But the aqueduct still stands. There it is, back in 1991 with a posing daughter. The aqueduct was built in 1797 and was designed by Thomas Telford. 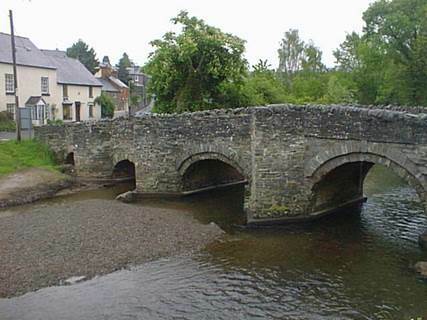 It replaced the earlier stone built aqueduct which was washed away by floods in 1795. Telford conceived the idea of the iron trough as a simple, cheap and effective method to keep the water in and allow canal boats to cross. 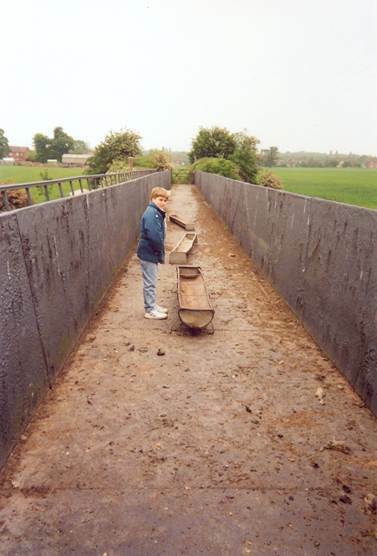 His iron trough is 57 metres long and was designed to take narrow boats, just seven feet wide. Because the trough is dry, it serves as a footbridge over the river so here’s son posing in the trough. It isn’t only we humans who make use of it. There are animal feeding troughs as well! For canal use we must imagine that the aqueduct is pretty well brim full of water. The boat would have fitted across the width and if you stepped off the boat you’d go over the edge and plunge down to the valley floor. 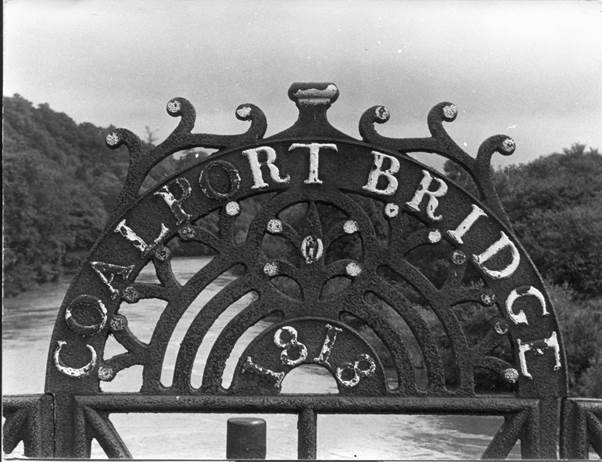 Telford’s system worked and he adopted it for his much larger aqueduct on the Llangollen canal at Pontcysyllte. 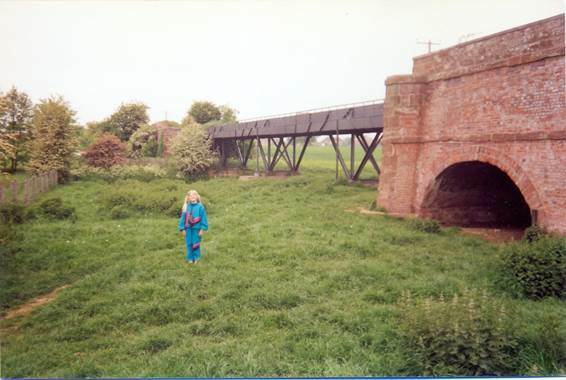 Longden upon Tern Aqueduct is a grade one listed scheduled ancient monument. As the prototype iron aqueduct, I think it deserves more than being almost a nothing in a field.